Ms TN is now back at her desk, dazed and bizarrely jetlagged after a mega-packed week in Perth. With some cunning scheduling, I managed to see most of the theatre and dance on offer at the Perth Festival. To make things easier, I had already reviewed a couple of events on their premieres in Melbourne - 1927's The Animals and Children Took to the Streets, and Lucy Guerin's Human Interest Story (click for reviews). The only shows I didn't get to were Western Australian Ballet's Dance at the Quarry, Black Swan's Boundary Street and the family show Apollo 13: Mission Control. Thinking back over the whole experience, what strikes me most is its emotional impact. For her final year as artistic director, Shelagh Magadza put together a diverse program of performance that plucked at a common human chord: from Alain Platel's exhilarating contemporary dance Out of Context to Yirra Yaakin's Waltzing the Wilarra, these were performances about making felt connections. A thread through all of them was humour, but this never elicited empty laughter. They were also, again in very different ways, responses to living in a complex and alienated modern world in which this human contact is marginalised and heavily mediated. It made the past week very rich and, in the best possible sense, heartening. If art doesn't give us courage, what is it for? The encouragement art can offer isn't, however, about distracting or deluding us: an important part of its power is its unflinching questioning of the world in which we live. The final two shows I saw - Trust, a collaboration between German playwright and director Falk Richter and choreographer Anouk van Dijk from the Schaubühne Berlin, and New York Theatre Workshop's Aftermath, an exemplary documentary theatre work about the Iraq War - are both overtly political works, although they couldn't be more different in their theatrical approach. Falk Richter is one of the most prominent of the current generation of German playwrights, a leading exponent of postdramatic theatre who creates texts that generate their energies from poetic rather than conventionally dramatic mechanisms. Last year Hoy Polloy premiered his play Electronic City, a work which, typically for Richter, explores the intimate effects of global corporatism on ordinary people. Richter is fascinated by collapse: in particular the intricate connections between economic and social collapse and its pathologies as traced through the details of individual lives. 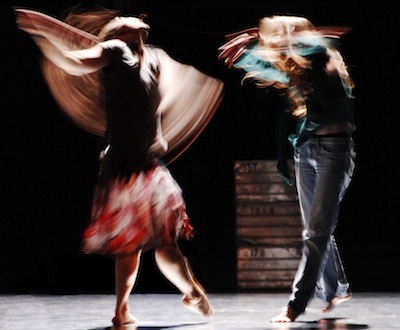 It's not at all surprising that such a writer should be attracted to dance theatre, and it's fascinating to see what happens when a writer with such a profound understanding of theatrical poetic works with a choreographer. It's clearly a fertile connection: Trust is Falk Richter's second of three collaborations with Dutch choreographer Anouk van Dijk. Together they create a profoundly poetic work of physical theatre, in which the performers trace through text and dance the collapse of trust in a complex contemporary world. Katrin Hoffman's stage design presents us with cavernous, exposed scaffolding in which items from domestic life - sofas, chairs - are littered on various levels. Musician Malte Beckenbach plays the score live on stage, ranging through acoustic songs to textured electronic noise. The nine virtuosic performers perform the text through microphones, narrating the story of a disintegrating relationship. Although it always seems to be the same relationship, the narrative flows from one performer to another, contradicting itself, becoming more complex and less certain with each repetition. The opening speech, which like much of the text is repeated by different performers, is a declaration of complete individual paralysis in which choice is a phantom: no matter what choice this individual makes, whether he or she loves or doesn't love, whether he or she leaves or doesn't leave, it will make no difference. This segues into a stand-up monologue which is, more than anything, a comic riff that leaps off the story of the break-up into an ever widening vortex of meditations on the collapse of systems, financial systems, political systems, pressing upon the psyche with a sense of increasing anxiety. In its po-faced alienation and almost myopic attention to detail, it reminds me of some of the early prose of Peter Handke, and it has an intellectual suppleness that itself becomes a symptom of this skittering panic, a sense that certainties are shifting, that the ground beneath our feet can no longer be taken for granted. This sets the scene for a kaleidoscope of movement and fragmentary narrative that circles around the erosion of private and public ideas of trust. One thing I greatly admired in this show was its unfaltering sense of rhythm, how its constant shifts seemed to spiral into greater intensity through its duration: it's a beautifully judged work, balancing acutely between humour and desolation, movement and stillness, that creates an almost hypnotic harmony. At times it almost becomes something like lucid dreaming. The dancers fall over, rise, fall over again, their movements somehow counter-intuitive, at times seemingly working against the expectations of the body and gravity. It's often satirical - there's a wonderful dialogue in which an unfaithful lover becomes a kind of avatar of the bankruptcy of politicians like Silvio Berlusconi - but nagging in the centre, coming into focus as the work progresses, is a notion of the suicidal nature of contemporary corporatism, the seed of collapse that the market itself makes inevitable, and the alienated delusion that makes this possible. The finance markets, Richter seems to be suggesting, are the actual terrorists, hypnotised by the beautiful possibility of destruction. Against this, Richter and van Dijk posit a mute vision of individual connection. It finishes with a fragile and moving vision of the possibility of co-operation. One dancer begins a beautiful succession of sweeping movement which promises collapse but which instead flows into an undulating dance, which is picked up by one performer, then by another, until the whole company is dancing in unison. It suggests another kind of relationship, another kind of trust. Trust was made in 2009, a direct response to the global financial crash; watching it now, as the seismic implications of that collapse still ripple across the world in protests across the Middle East and in America, it seems, if anything, to have gathered more meaning. The New York Theare Workshop's Aftermath is also a direct response to global politics: in this case, the Iraq War. It poses a fascinating contrast to Trust. The theatre couldn't be more simple: the nine performers enter a bare stage, and speak directly to the audience. When they are not performing, they sit back stage, their backs to the audience, slightly illuminated so we are aware of their liminal presences. I've seldom seen documentary theatre better done. The text is compiled by director Jessica Blank and Erik Jensen from interviews with Iraqi refugees that they conducted in 2008 in Jordan. As they say in the program, they spoke to as wide a variety of people as possible - Sunni, Shi'ite, Christian, atheist, working class, middle class (although they point out that as Iraq was largely middle class before the war, most of their interviewees are middle class). Their aim was to make a work of theatre that looked at what happened to civilians who, after the invasion of Iraq in 2003, found themselves in the middle of an increasingly vicious war zone. This work impressed me with its integrity. Although it is quite clearly directed towards an American audience, it scrupulously edits out the Western arguments about the war, pro and anti, in favour of presenting a bald narrative of the human impact of conflict. They've taken a lot of care to give as broad a view as possible of the violence in Iraq: the play includes accounts of atrocities by US military, Iraqi police and sectarian militia. But perhaps its most important message is that these things happened to people who are not faceless victims, abstract casualty figures or disposable Muslims. They are people who wish to live their lives, work, raise their children and make their homes, like everybody else. Aftermath uses the character of Shahid (Fajer Al-Kaisi), a translator, as a point of connection between the different narratives and between the performers and the audience. Shahid is a young man who learned his English through playing video games, and became a translator and fixer in the early days of the war. He introduces us to the characters, who are carefully chosen to represent a diversity of Iraqis: they include Yassar (Ryan Shams), a disarmingly vain and wealthy dermatologist who boasts about the swimming pool and fast cars he had before the war; an imam (Ted Sod) and Rafiq (Ramsay Faragallah), a pharmacist who lived in Fallujah. We meet them as the interviewers would have first met them, being welcomed into their houses, offered coffee, drinks, food, being asked if we mind if they keep the television on because of the World Cup match between Iraq and Australia. They begin by speaking of their lives in Iraq, the good and the bad: they tell us some good Iraqi jokes, classic instances of the black humour that flourishes under dictators like Saddam. All of them speak as exiles do of their longed-for and now vanished homes. All of them have photographs which they show the audience, the only traces they possess of homes now vanished, people now dead. The stories of violence come later in the piece, once we have some understanding of who these people are. And when they do, they are devastating: Rafiq tells of how his nephew was randomly and brutally shot in a house raid by US soldiers; Basima (Leila Buck) how she lost almost her whole family, including her two month old baby, when their car was blown up as they took the baby to have its vaccination shots, suffering horrific burns herself. "Translate that," she says fiercely to Shahid. The imam Abdul-Alyy (Ted Sod) is arrested on false grounds and ends up in Abu Ghraib. When the translator says that many Americans are sorry for what happened there, he explodes in rage: "There are mistakes," he says, "for which apologies are not enough." All these accounts are delivered with a profound theatrical tact, which saves the play from being a sensationalist exploitation of the suffering of others. The directness of theatre gives these stories an unmediated power impossible in other media, reducing the sense of voyeurism with its direct invitation: and it also, crucially, gives its characters an inviolable autonomy, which prevents them from being merely "victims". Hovering beneath the surface is an acute awareness of the untranslatability of experience: the gap of understanding is permitted to grate rawly. As with life itself, there are no neat endings. It's impeccably performed by a hugely impressive cast, and the simplicity of its staging and conceptual framework reinforces the complexity of the experience it offers. I thought the dramaturgy wavered a little towards the end, rising to a premature emotional climax that left its denouement to flap in the wind, making it feel a little long. Even so, it's gripping from its opening moments, and makes necessary, unmissable theatre, infused with a knowledge that seems as urgent now as it did when it was made. I wish all documentary theatre were this good. Picture: Trust by Richter Falk and Anouk van Dijk. Trust, a project by Falk Richter and Anouk van Dijk. Stage design by Katrin Hoffman, costume design by Daniela Selig, music by Malte Beckenbach, dramaturgy by Jens Hillje, lighting by Carsten Sander. With Peter Cseri, Anouk van Dijk, Lea Draeger, Jack Gallagher, Vincent Redetzki, Judith Rosmair, Kay Bartholomäus Schulze, Stefan Stern, Nina Wollny and Malte Breckenbach. Schaubühne Berlin. Until March 2. Aftermath, by Jessica Blank and Erik Jensen, directed by Jessica Blank. Lighting by Caleb Wertenbaker, costume design by Gabriel Berry, stage design by Richard Hoover, music and sound by David Robbins. With Omar Koury, Fajer Al-Kaisi, Leila Black, Maha Chehlaoui, Ramsey Fargallah, Rufio Lerma, Ryan Shams, Ted Sod and Rasha Zamamiri. New York Theatre Workshop. Until March 1. Was Trust performed in english or german? I saw it at the Schaubühne a while ago and the text there was the latter. German, with surtitles. There were occasional sentences in English.